Carl Berg, owner and founder of Hawaiian Wildlife Tours on Kauai, likes to tell the story about a couple from Los Angeles who retained his services a few years ago in hope that he could show them nene (Hawaiian geese), Hawaii's state bird. When: Varies; tours are scheduled by prior arrangement only. Cost: $45 per hour per couple; $22.50 per person per hour for up to two additional people (tours are usually limited to four; larger groups can be accommodated by special arrangement). Notes: Dress comfortably and wear sturdy walking shoes. Bring a hat, sunscreen, light jacket and drinking water. "They had seen nene on a previous trip to Hawaii and wanted to get photos of them," recalls Berg. "I took them to Hanalei National Wildlife Refuge because that's where nene are easily seen on Kauai." After they parked their car, Berg and his clients spotted a few nene in the distance. The couple brought out their cameras with long telephoto lenses, set up their tripods and loaded their film. "By the time they were ready to shoot," says Berg, "two geese were standing on their feet -- literally! They thought they were going to see nene from a couple hundred yards away and were amazed to find the birds weren't shy about coming right up to them." Berg's personalized three- to four-hour nature tours are eye-openers for participants, many of whom live in big cities and have never before gotten up close with nature. Boasting a broad background in Hawaii's natural history, Berg earned his doctorate in zoology from the University of Hawaii-Manoa in 1971; spent the following two decades in New York, Massachusetts and Florida as a university professor and a research scientist; and retired in Hawaii in 1990. Kilauea, on Kauai's lush North Shore, has been his home ever since. "Why Kauai?" Berg muses. "I wanted to live on the Hawaiian island that was the most rural, natural and beautiful, and the one that had the most animals. Kauai offered exactly what I wanted." Carl Berg leads people on a tour of Mahaulepu, on the South Shore of Kauai, that offers native coastal plants, Hawaiian cultural sites and fabulous vistas. In 1994 he started a year-long backpacking trip around the world to visit all the exotic locales he'd read about. He explored Palau, Yap, Guam, Pohnpei, Kosrae, Indonesia, Thailand, Malaysia, Nepal, Tibet, Burma, Saudi Arabia, Rome, Italy, Germany, Austria, France, Greece and the Netherlands before returning to the United States. "What I discovered on my round-the-world trip was eco-tourism," Berg says. "My first experience with it was in Bali where I met a man who took people out bird-watching. I went on one of his tours, and it was incredible, fascinating! He had a wealth of knowledge, he was having a great time sharing it and he was making a little money." Back in Hawaii, Berg, who had spent most of his career as a marine biologist, turned his back to the ocean and noticed how magnificent the mountains, forests and valleys were. He says, "I started hiking, camping and appreciating everything I saw on land." Although he had retired from teaching, friends were constantly asking him to take them or their visiting friends and relatives on hikes so they could learn more about nature's wonders. The thought struck Berg: Why not start his own eco-tour company? "I wanted a name that stressed what I was doing, which wasn't adventure tours," he says. "Plants, birds, reptiles, mammals, marine life -- wildlife was what I was focusing on. Hawaiian wildlife." Thus, Hawaiian Wildlife Tours was born. It's celebrating its 10th anniversary this year. Carl Berg and a tour member spend time with endangered nene in Hanalei. ACCORDING TO Berg, the primary goal of Hawaiian Wildlife Tours is to provide environmental education and encourage conservation in Hawaii. 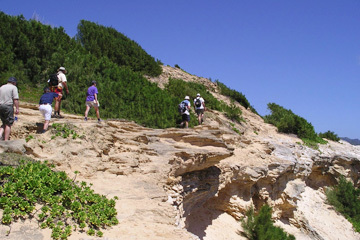 Each tour is customized; each itinerary is planned with input from the clients. "I talk to my clients ahead of time and ask them what they want to do and see," Berg says. "I also assess their health and physical condition to determine what they are capable of doing and seeing. Many of my clients are mature travelers who are in their 50s and older, so they aren't able to do anything really strenuous. We go at their pace and stop when they're ready to stop." Kauai's North Shore ranks high among Berg's preferred destinations because of its beauty and abundance of wildlife. Hanalei National Wildlife Refuge, for instance, harbors the nene, koloa maoli (Hawaiian duck), coot, stilt, moorhen, aukuu (black-crowned night heron) and a host of other tropical birds. The kolea (Pacific golden plover) spends the summer in Alaska, but in August it flies to Kauai en masse. "It's all over the North Shore," says Berg. "Through mid-April you'll see it on lawns, in taro fields, in the marshes of the wildlife refuge. If you go to the estuary where Hanalei River meets Hanalei Bay, you'll also see shorebirds like the wandering tattler and ruddy turnstone walking up and down the beaches, especially in early morning." 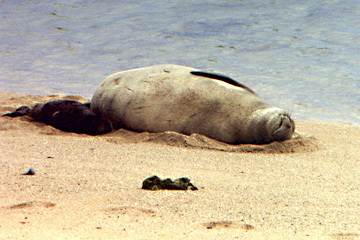 A Hawaiian monk seal and her newborn pup rest on a Kauai beach. COME WINTER, exotic species like the baikal teal blow in on the winds from Asia. Notes Berg, "These are birds that people on the mainland would otherwise never see." Monk seals and green sea turtles also captivate tour-goers. These endangered creatures often sunbathe in the coves at Kilauea Point National Wildlife Refuge, another place that Berg enjoys showing visitors. In November the Laysan albatross will return to the refuge. "It'll stay until July," says Berg, "and when it leaves another species will come to Kilauea Point to nest and give birth to its babies. There are several species of birds there all year long; when some leave, others come. It's like time-share." Within the next month, Hawaii's state mammal, the humpback, also is due to arrive for its winter visit. Each year, it makes the 3,500-mile journey from Alaska to breed and bear its young in warm island waters, and Berg asserts whale watching is great from the bluffs and beaches of Kauai's North Shore. He's versed in botany as well. At the lighthouse at Kilauea Point, he points out native Hawaiian naupaka kahakai, ilima papa, akoko and aheahea, which apparently is the only plant red-footed boobies use to build their nests. Berg usually starts his tours early, around 7 a.m. when it's cooler and there's a better chance to spot wildlife. "That's when they emerge from their nighttime hideaways to forage for food," he explains. "I have an idea of where I want to go based on what the group is interested in, but the itinerary can change because I may find out a baby bird got hatched or there's a monk seal on the beach. I ask my clients to be a little flexible because you never know what's going to turn up." Nature never fails to awe and delight. Berg once took honeymooners from Manhattan on a hike in Kokee. After an hour the husband, who was in his late 30s, confided that he had never walked on a wilderness trail before. "He told me all his life, he had walked on sidewalks and on grass in Central Park," says Berg. "He had never been out in a forest or by the ocean before. I thought he was kidding." When the man married, Berg continues, his wife told him they were going to have fun outdoors on their honeymoon in Hawaii. So there they were, getting muddy on a hike miles away from the nearest slab of concrete. "The husband loved it," Berg said.